For many boat companies, the Fort Lauderdale International Boat Show plays a vital role in generating business through the introduction of new products. Case in point: Regulator Marine of Edenton, N.C. Earlier this month, I spent a couple of hours at Regulator’s largest dealership, Oyster Harbors Marine in Osterville, Mass. I was there to test the new Regulator 25 center console with twin four-cylinder Yamaha F200s (also new). Oyster Harbors has sold two 25s since July, but “there are a lot of people who just don’t know about it yet,” Oyster Harbors vice president Peter Maryott said. Regulator president Joan Maxwell believes the boat’s presence at FLIBS will help spread the word. Click play for a look at the Regulator 25. Regulator has never had the same presence in Florida as it does in New England, but “we’re working on it with the new product and a very aggressive marketing and demo boat program,” Maxwell said. It’s early, but sales of the 25 have gotten off to a healthy start, Maryott said. “We only just started taking delivery of the 25 in July, so two boats is pretty good,” he said. Oyster Harbors also carries the Viking, Cabo, Hatteras, Jupiter, Blue Star, Limestone and Tiara brands. Maryott arranged the boat test for me. There were no 25s available in Florida (I live in Sarasota), so I carved out an afternoon while on vacation on Cape Cod to check out this boat. Oyster Harbors broker Blaine Richmond served as my guide. As he motored out of the channel, I walked around the deck, checking out all of the lockers, fishboxes, seating arrangements and hardware. Regulator cuts no corners when it comes to construction, workmanship and attention to detail. With no more than 1-foot seas, it was hardly the ideal day for a boat “test.” Designed by naval architect Lou Codega, the 25’s deep vee should have no problem fending off sloppy seas. With the twin F200s the boat’s gets optimal fuel economy of about 2 miles to the gallon from 31 to 36 mph. She topped out at 51 mph. 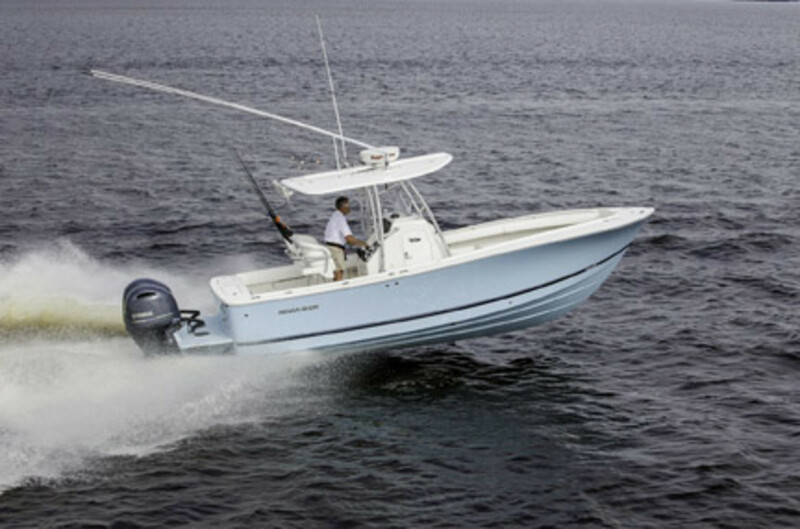 The 25 replaces the first-ever boat from Regulator — the renowned 26. The introduction marks the company’s 25th anniversary. The boat will be on display at C Dock 318, 318A-C at the Bahia Mar.